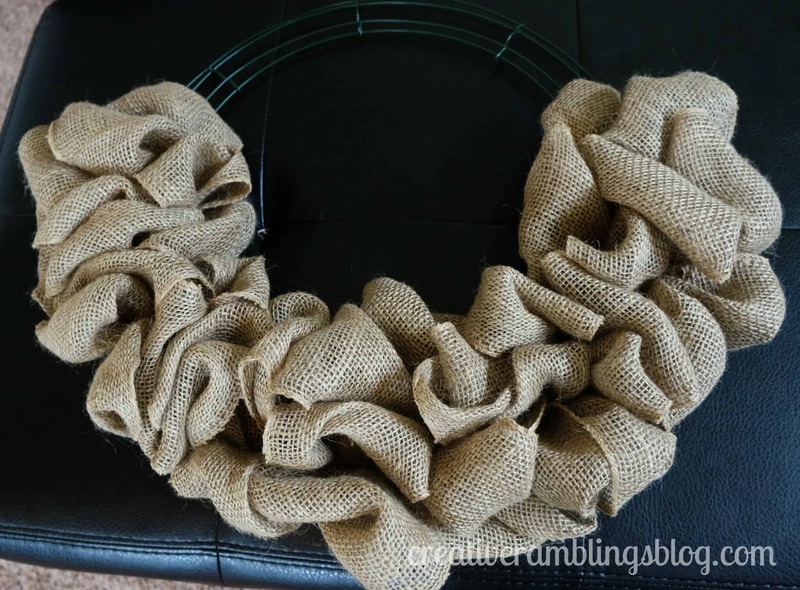 Are you a burlap fan? 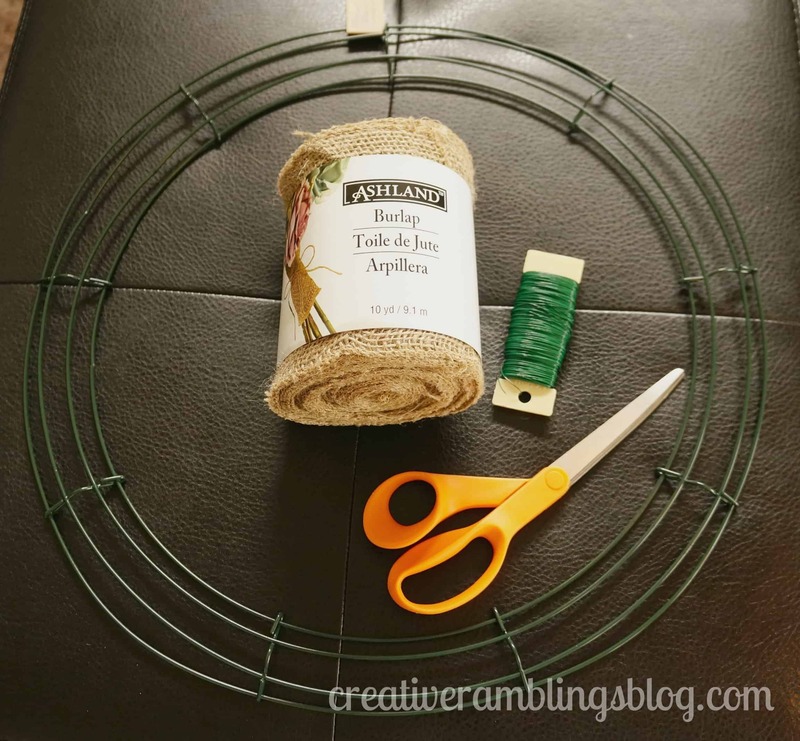 I have an easy to follow tutorial for a versatile wreath that you can customize for any season or holiday. My style in general is pretty clean and simple; basic pieces and geometric patterns. But there is something about burlap that I just love! I use it as an accent throughout my home and like how it contrasts with my more modern decor. 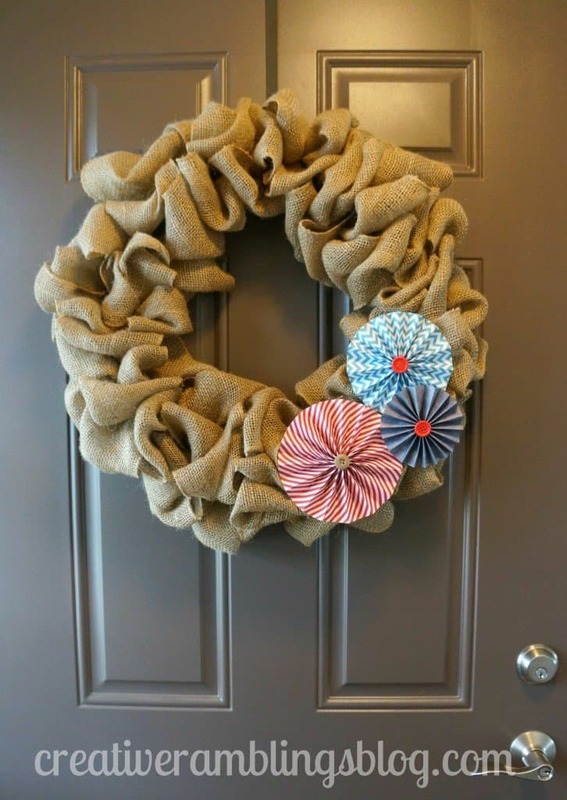 I love all the burlap wreaths I’ve seen lately. I like these because they are so basic and can be styled anyway you want. I decided to take a stab at a burlap wreath after reading this tutorial from Some Kind of Lovely Ride. It looked so easy and really beautiful. Since burlap is really “in” Michael’s had exactly what I needed right by the front door; score. I grabbed a 22″ metal wreath frame, some burlap on a roll, and floral wire. I started by attaching one end of the burlap to the frame with floral wire. 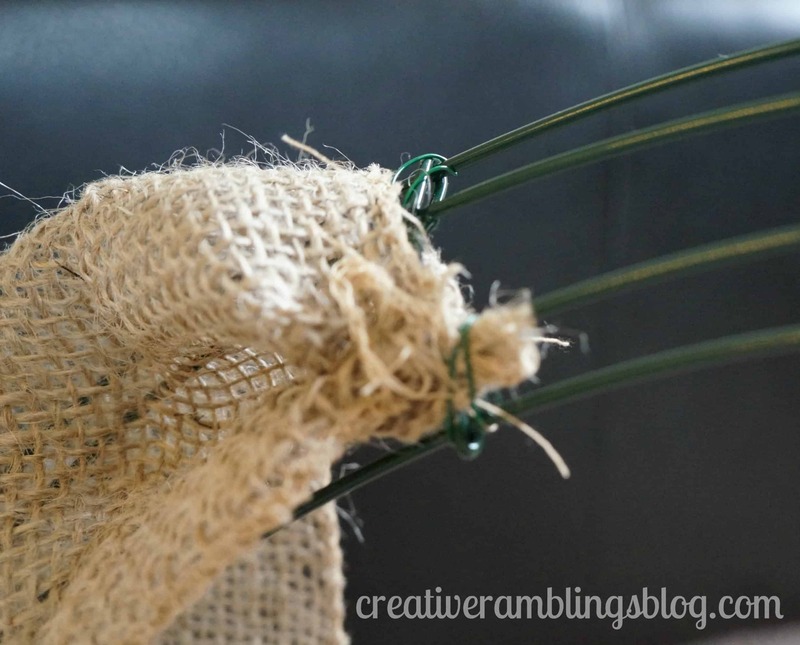 From there I looped the burlap through the frame to create a big full look. It took almost 2 rolls to fill it up. I really like it, nice and full and not to overpowering. Next I needed to dress it up a bit for my front door. It’s almost Independence Day so why not be a little patriotic. 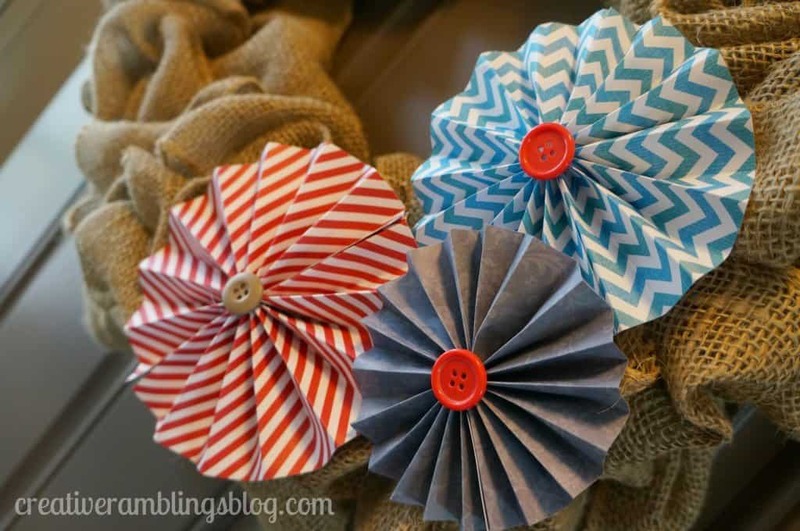 I created the pinwheels using red white and blue card stock and buttons. It’s nice when you can decorate for a holiday without buying anything new, I had these papers on hand. They are not specifically patriotic, but when paired together they look great. I used floral wire to attach them through the burlap and onto the frame. I thought about hot glue but I’d like to change this out now and then and the wire removes easily. This wreath now hangs on my front door and adds a nice pop of color you can see from the sidewalk. I can easily add modern fall and winter decorations as the seasons change too. So tell me, what do you think? What is on your front door and what does it say about you? Beautiful wreath, Sarah! I love the red, white & blue accents. 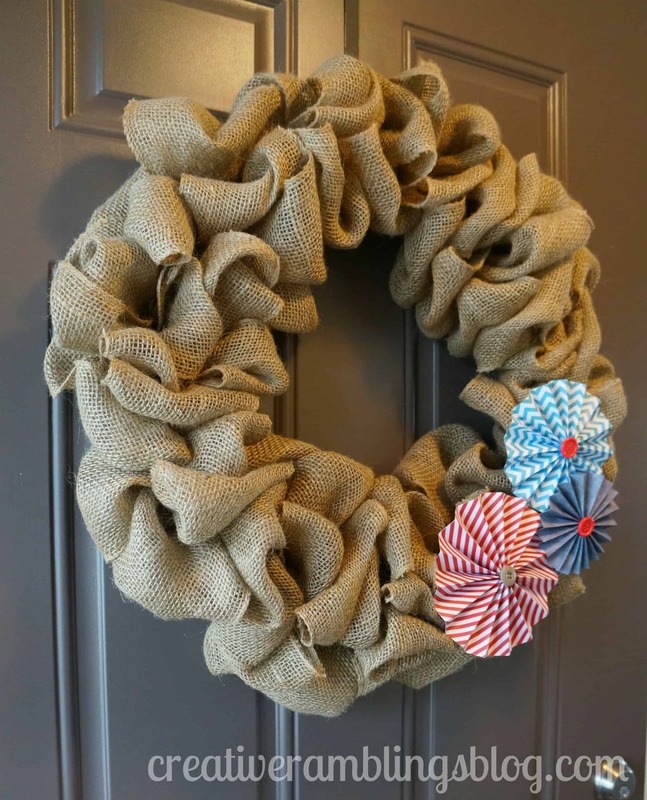 I’ve been dressing mine up with different faux flowers, initials, & accessories over the past few months (it’s on my interior front door, too) – great idea for a 4th of July version! Now I’ll have to check out the rest of your blog! Aww! Thank you Laura, I’m so glad you stopped by. Thank you Lisa, just started following you on Bloglovin as well. Glad you came by. How pretty! You did a fantastic job! Thank you Veronica, glad you stopped by. At some point in time, I’ll learn how to be able to READ directions… I’m such a visual person. You’ll have to let me know when you have YouTube tutorials! I LOVE burlap! And this wreath can be used all year long with just a change to the accessories! Haha! I seriously have been thinking of doing a YouTube tutorial for a project. Not sure what yet but hopefully i’ll have one up this summer. Thanks Jenna, I love your party, always find such great projects. Thank you Emily! I love your blog and party, I’ll head over right now. Awe! Thank you, you are too sweet. Thanks for stopping by! Gorgeous! And not too “Shabby Chic” at all! I absolutely love how easy it will be to change out for the seasons! I’ve been dying for a tutorial like this, thank you! Thank you Kylie! It was super easy, have fun with it. I love the wreath and have all the materials but i guess i need visuals also. I dont understand when you say you loop it through the frame. There are 4 wires, do you weave it in and out or what. I feel so silly because I can’t get it. Please help. I totally understand, I am a visual person too but this was such an odd thing to take pictures of while working on. My frame has 4 wires as well I looped it in and out of the wires until I got the look I wanted. After a couple tries it worked ( I did start over once or twice). I linked to the original tutorial I found helpful in the post. Try that link too, she has lots of pictures. Best of luck, thanks for stopping by.